Home / _Movies / Christopher-Lee / Gremlins / Gremlins-2 / Movies / The Surprising Reason Fats Domino is in "Gremlins 2"
The Surprising Reason Fats Domino is in "Gremlins 2"
Fats Domino, the iconic rock and roll singer, has died at 89. The singer, born Antoine Dominique Domino Jr., was a true legend with 35 records in the U.S. Billboard Top 40, and five of his records sold more than a million copies, being certified gold. His music has become a fixture in Americana and pop culture. His songs have appeared in dozens of movies but the story of how his song ended up in a movie has never really been told. 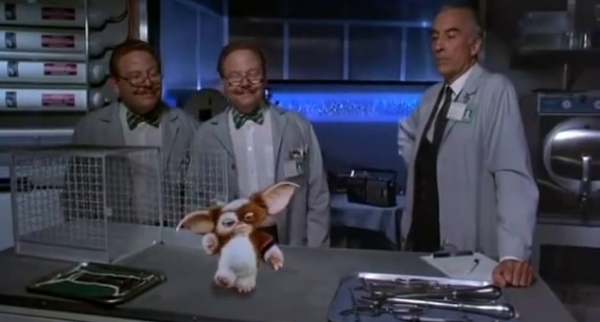 The movie Gremlins 2: The New Batch is a sequel to the 1984 hit Gremlins. The first film is a horror comedy about a cute creature named Gizmo who's sadistic brethren terrorize a small town. The sequel has the mischievous Gremlins taking over a high-tech tower. When the sequel was planned the special effects were handed over to the legendary Rick Baker. Most of the special effects were done on-set with puppets both traditional and mechanical. The animatronic puppet of Gizmo was larger and more expressive. One scene took the longest and was the hardest to film. It was originally supposed to have a popular Billy Idol song but it was replaced with Fats Domino's. Why? Director Joe Dante explained to Entertainment Weekly the reason for the change. "The most difficult stunt of all was getting Gizmo to dance," Dante says. "And then we couldn’t get the rights to the song he was dancing to, Billy Idol’s 'Dancing With Myself,' so we ended up finding this Fats Domino song ("I’m Ready") at the last minute that happened to have exactly the same beat. That was the last shot of the movie." For fun, I made a video that puts the song back in the first scene. Update: Sorry. The video is blocked by YouTube in most countries. What do you think of the clip? Would you have preferred Billy Idol over Fats Domino? I actually would prefer the first movie over the second. I hardly even remember the sequel. In the 80s most people would have probably preferred Billy Idol. Probably not so much today.